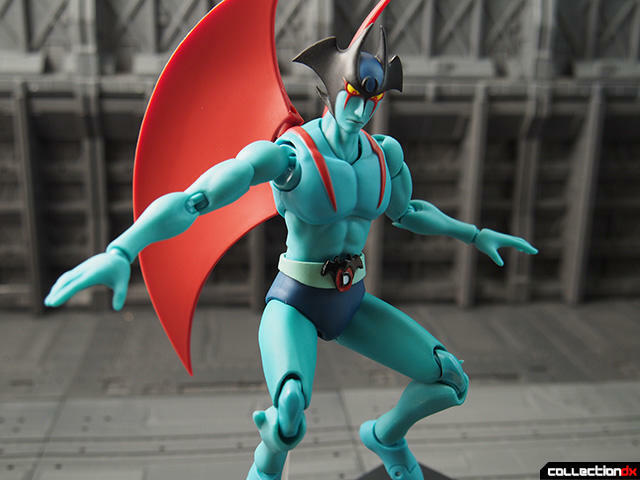 Home » 2017 » Devilman D.C.
Devilman D.C. is part of a series of toys that celebrate the works of Dynamic Productions. 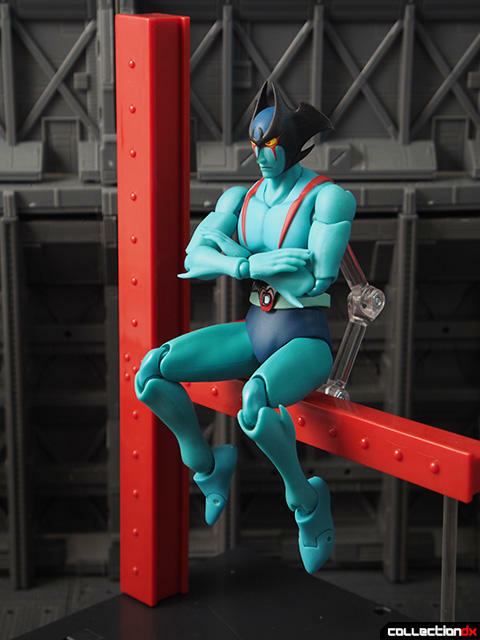 There were releases across both the Figuarts and Soul of Chogokin lines. 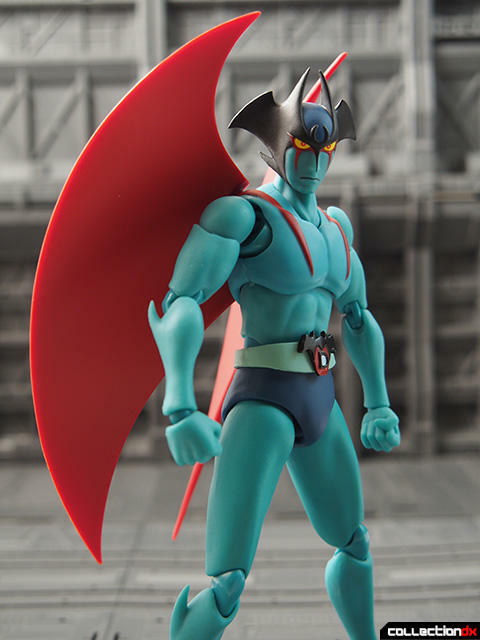 Devilman is a S.H. 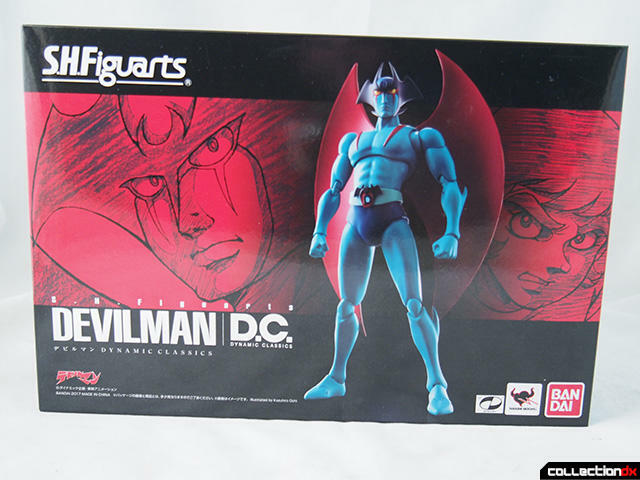 Figuarts release, although the packaging and base are similar to Soul of Chogokin. This is to create synchronicity between the various releases. 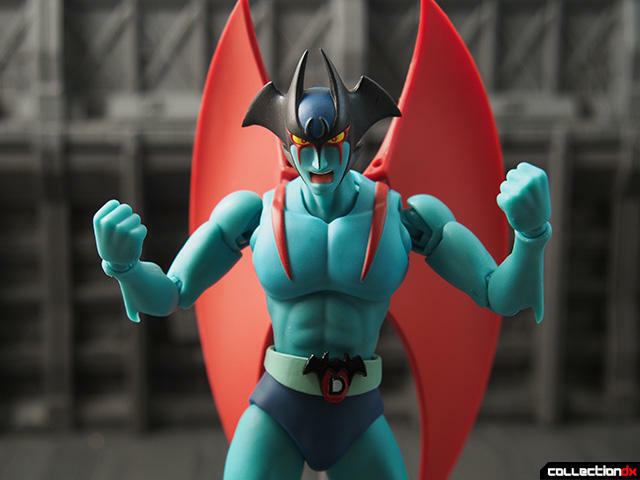 Devilman appears as shown in the 1973 movie "Mazinger Z vs. Devilman", a movie that is as old as I am. 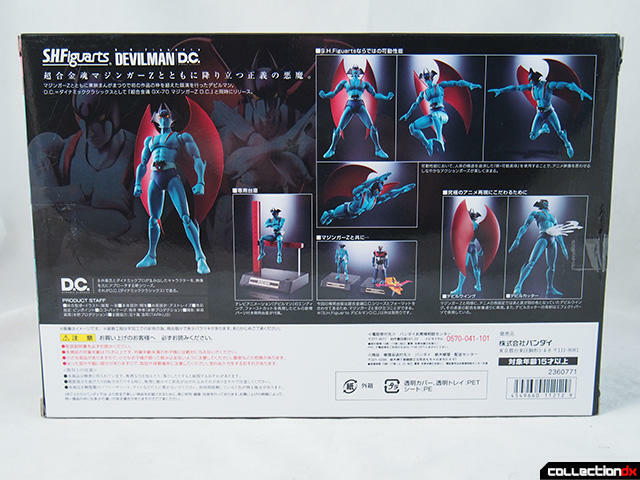 The box is pretty large for a Figuarts release, mostly due to the large iron girder pieces for the display. 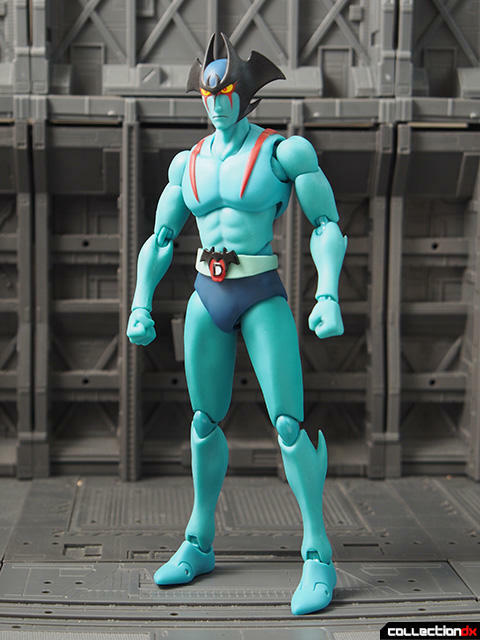 I think Bandai could have made this a bit smaller by making the girder multiple pieces. 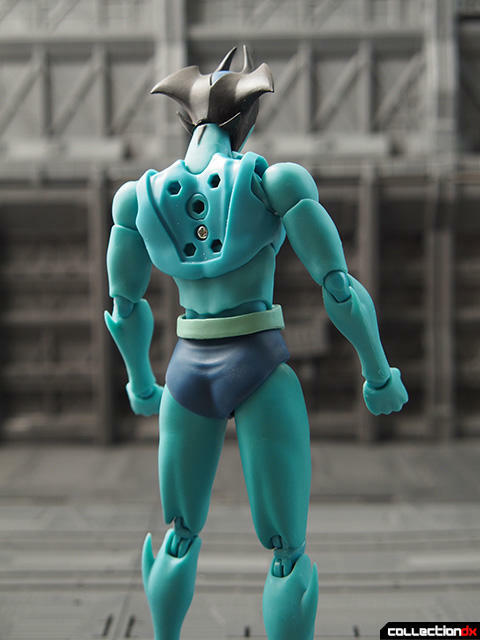 The figure is fine for a Figuarts, although I don't like the gaps in the shoulder joints. 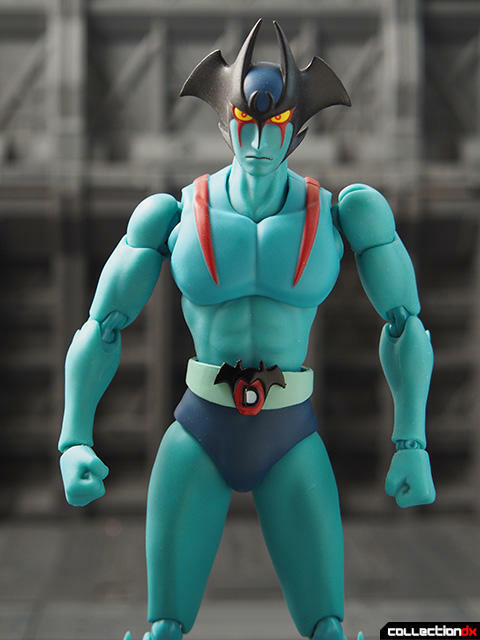 I get what Figuarts are all about, and I know that is important for some people, but as I get older I value simplicity. 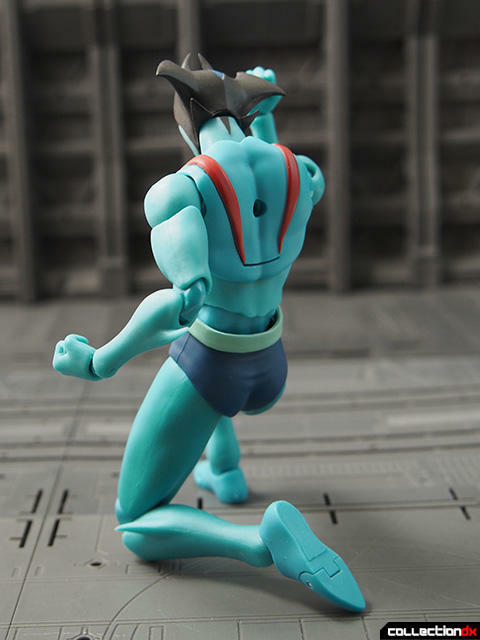 I just didn't have any fun posing the figure, but that is a reflection of me, not of the toy. 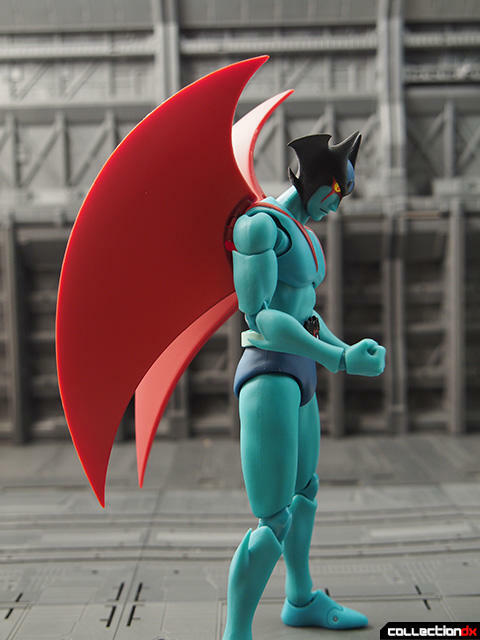 This thing can throw any pose you want at it. 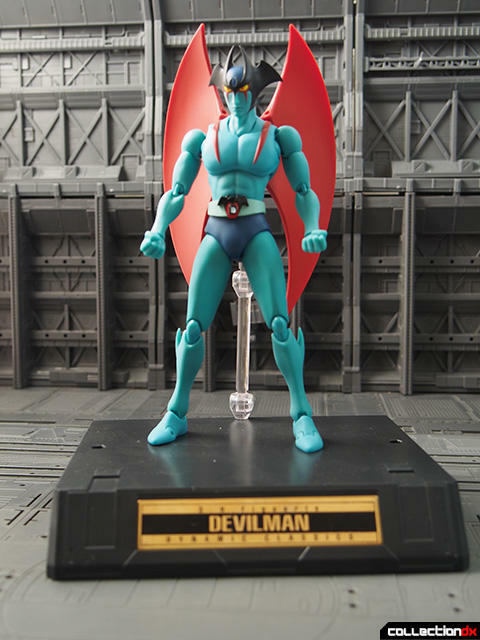 I just wanted a good looking Devilman for my shelf. 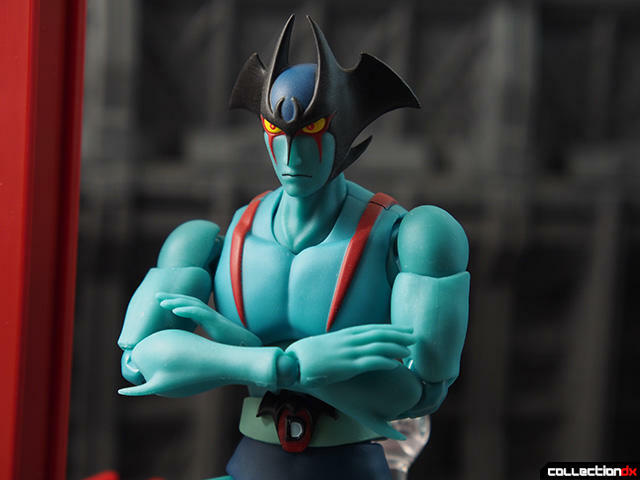 Devilman stands 17cm tall, and is represented here to try to be as accurate to the anime as possible. 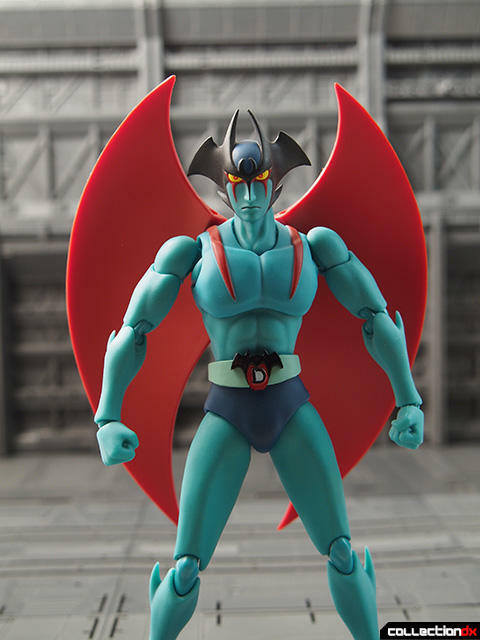 I haven't seen much Devilman, but I assume it's fine. 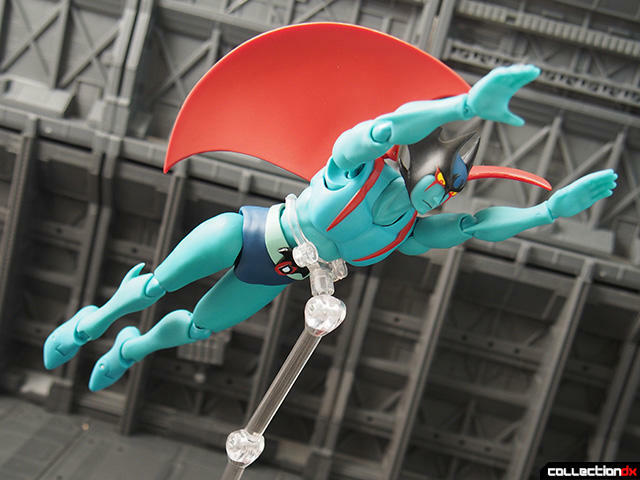 Articulation is more than necessary. Included are various hands: open hands, closed hands, hand shaking hands. The pop on and off easily. 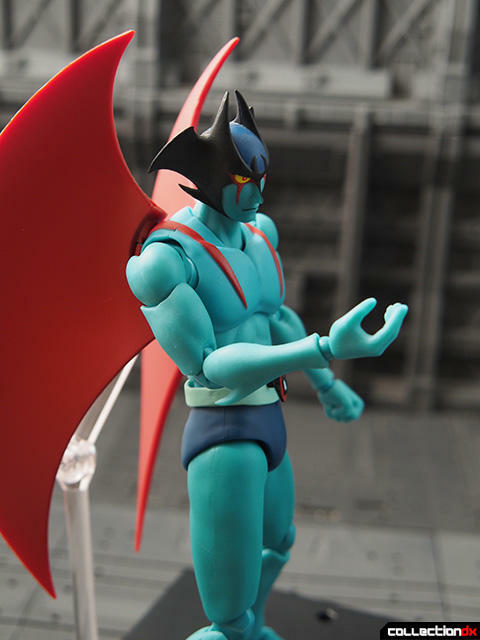 Devilman is not complete without his signature red wings. 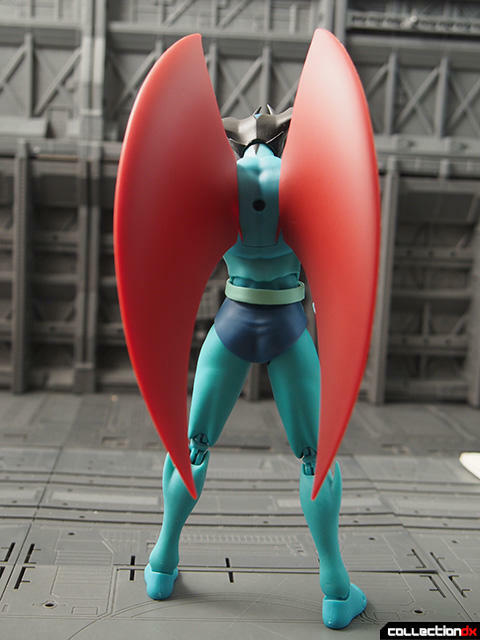 The panel on the back of the figure is removable and gets replaced with the wing assembly. Each wing can rotate and swivel. They are made out of firm, matte plastic. 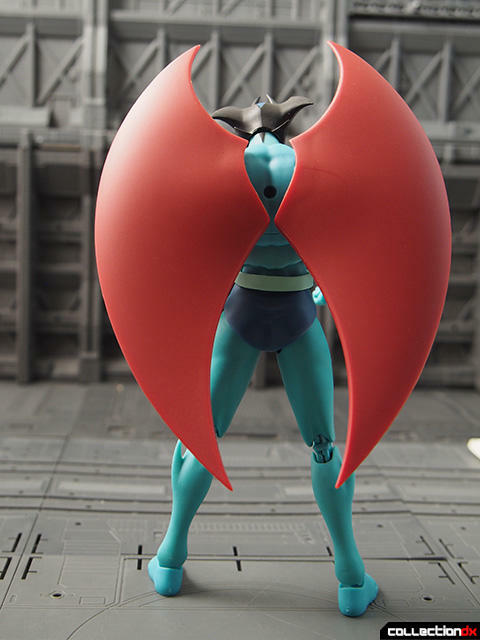 My only concern with the wings is that the movement is limited if you have attached a Tamashii stand to the hole in the back. Three heads are included, with different facial expressions. Two of them just have the eyes in different directions but the third one has a screaming mouth. 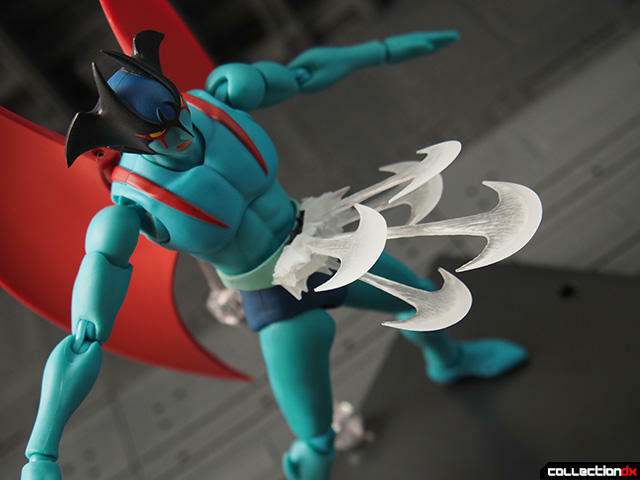 His Devil Cutter weapon is represented by a piece that plugs into the belt when you remove the buckle. 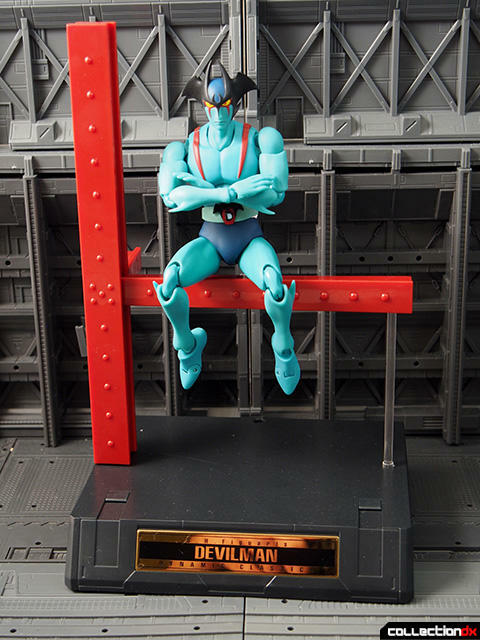 As mentioned before, the stand features an iron girder support for Devilman to sit on. 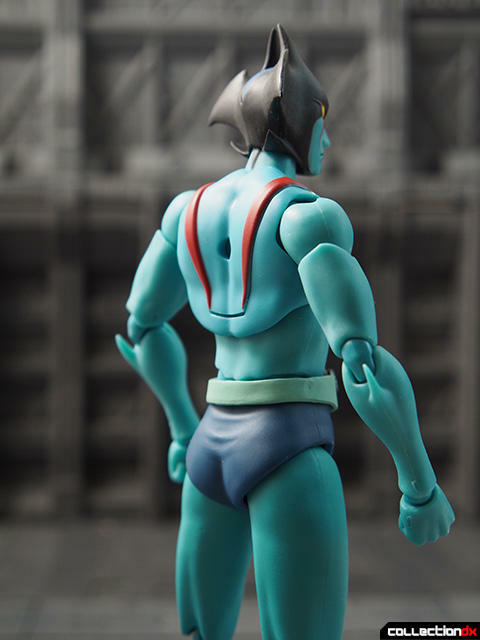 A special short Tamashii stand piece is used to anchor him to the stand. 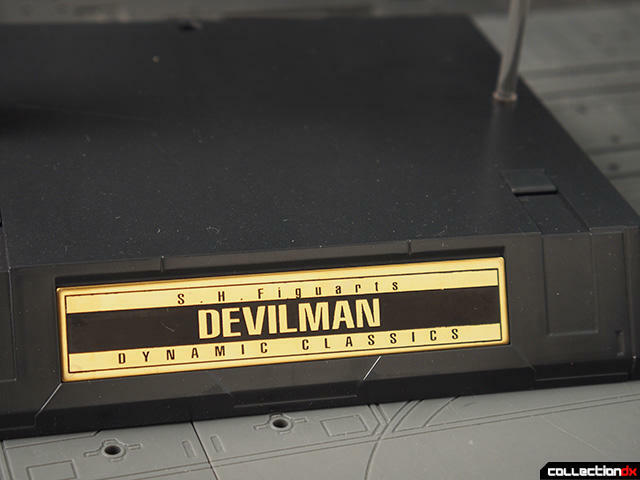 The base plate is just like a Soul of Chogokin Base. 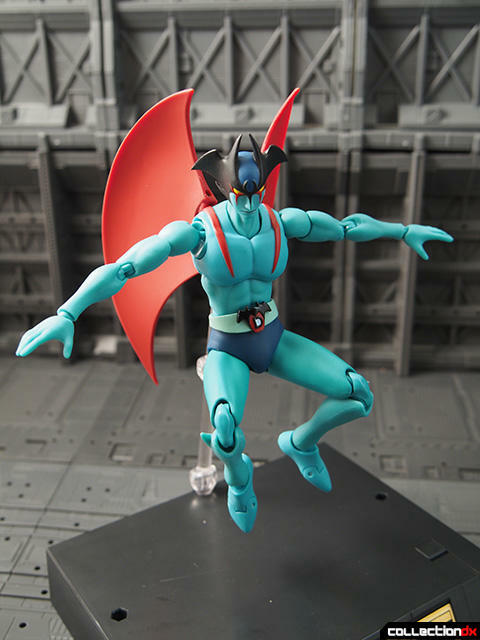 You can remove the girder parts and just the regular Tamashii stand parts, which are included. 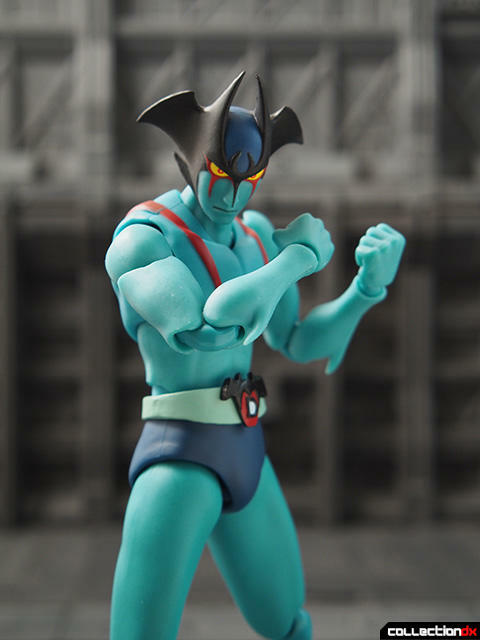 You can stand him up or even do a flight pose. 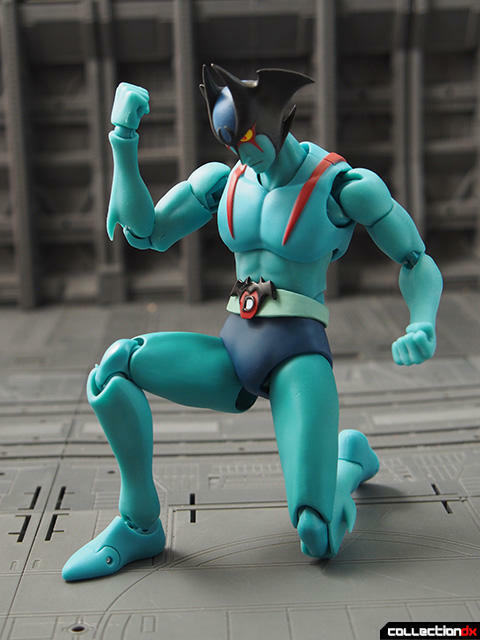 I'm pretty sure the special hand is intended for the crossed arms pose. 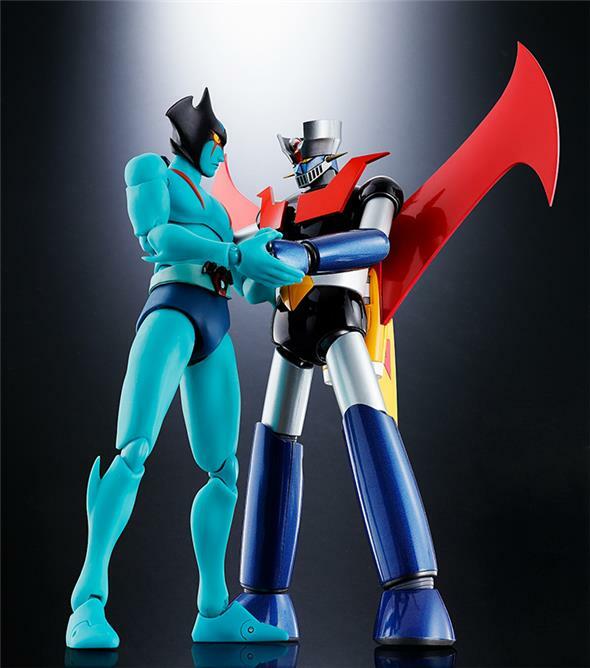 If it were a handshake hand, I'd imagine there'd been some kind of a promotional photo showing it off, and I don't think the GX-70VS set comes with a corresponding hand. 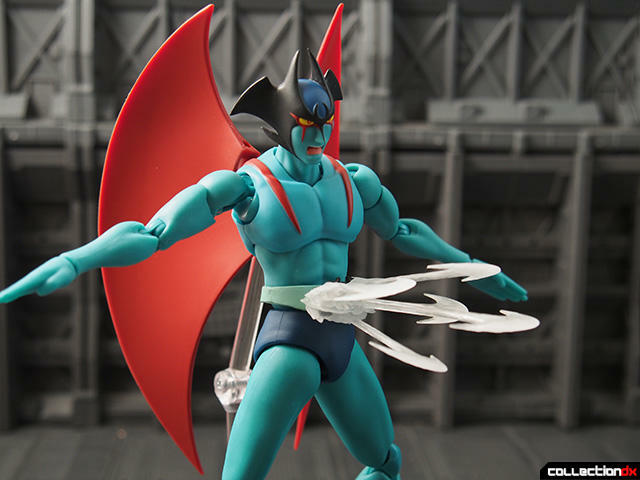 My biggest grievance with this figure is that the wing backpack plate doesn't have a slot in it to pry a fingernail into, and I don't feel particularly comfortable trying to pull it out by the wings because the plastic joints do not seem particularly strong. I'd show you a picture, but I tried to upload it into the gallery here and ended up with a photo for ants.